I’ve been something of a retro-Luddite when it comes to gear-shifting technology. Party this is because I had several 9 speed race wheels, and I wanted to maintain interchangeability between bikes, and (I am embarrassed to admit) I found it difficult to figure out which parts I’d need to buy to set up a TT bike with Shimano Di2. Enter SRAM’s new electronic gear system, eTap. 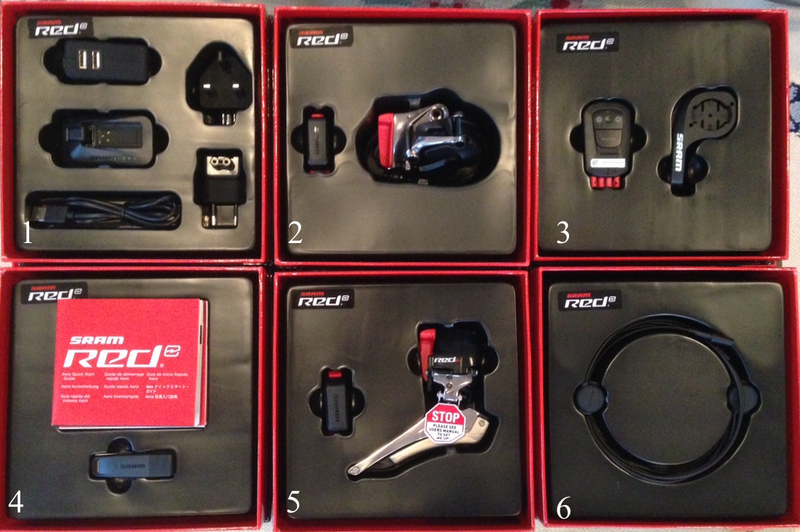 For road bikes, this is a pretty straightforward system. Each brake lever has one gear change switch, and it operates the derailleurs wirelessly. Satellite shifting switches (the ‘’blips”) allow shifting from the top of the bars or clip-on aero bars. The right hand control shifts the rear mech up, the left control down. Pressing both controls at the same time changes the front mech either down or up, depending on which position the mech is currently in. This spring, SRAM released the eTap Aero, intended for use on TT and triathlon bikes. I decided it was time to (a) get modern, and (b) get 11 speed. So I set my Wiggle profile to email me when the eTap aero was available. Ages later, I got an email saying it was in stock. I popped over to the Wiggle website to find four sets were available. I ordered one, along with an 11-speed Dura-Ace cassette and an 11-speed SRAM chain. A few days later a vast box arrived at work. The post room called saying they thought a wheel had arrived for me! Inside was the cassette and chain, and an enormous and very heavy black and red box that just exudes quality. USB battery charger. This comes with all sorts of wall socket adapters, and is for charging the derailleur batteries. The rear derailleur, with the battery detached. The red part covers and protects the attachment point of the battery: there’s a complementary part to protect the battery – the front derailleur comes with identical parts. The blipbox. This is quite small, and has a Garmin style twist mount, there are several included. Neither mount with self adhesive pads matches the curvature of the top plate of my aerobar, so I used the normal Garmin mount held in place with stretchy bands (but see below). One USB stick for firmware updates. Just the USB stick. Nothing else other than a few scraps of paper. The front derailleur. This has the battery detached for transport, and a buch of weird little wedgy things, about which more later. Also, it has a horribly alarming sticker saying you MUST read installation instructions before using it. You need to retrieve said instructions from the SRAM website. Two sets of ‘blips’ (i.e. four blips in total). These are the switches that connect to the ‘blipbox’, which actually controls the derailleurs wirelessly. So, not much in that box. Underneath these six boxes is a set of brake cables (inners and outers), the presence of which completely mystifies me. I assume that the eTap aero set would be bought either to upgrade a TT bike (as I did) or for a new build. Neither scenario would seem to require a set of brake cables to be supplied, though no doubt they will come in useful in due course for another bike project (my TT bike has hydraulic brakes). Sadly, no Haribo gummy sweets were present. I began by fully charging the derailleur batteries. Because the front and rear derailleurs use exactly the same type of battery, if the rear runs out of juice, you could always swap in the front mech battery. The instructions provided observe that when the battery is detached, both the battery and derailleur need to be protected by the plastic parts supplied to protect the connection parts. I believe the system is activated by motion sensors, and the recommendation when transporting the bike by car is to remove the batteries to avoid unintended discharge. Installation turned out to be stupidly straightforward. In fact, the biggest hassle was feeding the blip cables through the base bars, but a little ingenuity sorted that out. Pairing the three components (rear and front mech, and the blipbox) took less than 30 seconds. On my TT bike, the wires from the blips pass through handlebar setup internally, using the pre-existing slots cut for gear and brake cables (the P5’s hydraulic hoses are entirely internal). Deciding where to place the blips on the base bars and aero extensions took a few minutes, before I taped the bars. And then a test. Well, the controls worked well, though the rear mech wasn’t quite aligned with the sprockets. A quick perusal of the manual showed how to fine-tune that. Then all was done. You might be wondering about that alarming sticker on the front mech. I can only assume that refers to the funny little wedge pieces that apparently brace the mech against the seat tube of the frame. It’s not obvious why these are needed, but I complied. So, I’m using a Campagnolo Record chainset with TA rings, SRAM mechs, SRAM chain and Dura-Ace cassette. Does that combination work? Well, on the basis of riding out to a 10 mile time trial, riding the event, and riding back, I’d say so. Shifting was very smooth (I might even suggest too smooth – I did miss the positive click of my old Dura-Ace levers), and I found the usage of the blip switches really very intuitive. I made no inadvertant gear changes, though to be frank I didn’t do many changes with the front mech. Battery life presumably depends on the number of shifts you do. The blipbox uses a CR2032 cell, which i supposed to be good for over a year. Each derailleur has a rechargeable battery supposedly good for 1000km/60h of use. The system uses the same battery design for both mechs, so they are interchangeable. In the week following my first ride with the system, I revisited the mounting of the blipbox. Its garmin mount section is threaded for a screw, so I drilled the top plate of my aero bars, and fix it in place that way. It’s a fair bit neater than the elastic bands! I rode the system in the NBRC Hardriders club ’20’, and did have some hassle with my mongrel transmission – the chain didn’t want to seat properly on the inner ring. Hopefully I can sort this out without resorting to a new chainset. Well, it’s nice. It works well (faultlessly so far on my limited riding to date). I now have 11-speed on this TT bike. It doesn’t require any guddling around persuading cables to pass through the frame. I am pleased with it. But does it represent a major performance improvement over the old style mechanical Dura-Ace it replaced? Well, I’m not sure, though I very much like having a second set of controls near the brake levers. I can say, though, that were I to spec out a new road bike, a SRAM eTap group would be high on my “to buy” list. Longer term, I’ll do an update on performance (part 2! ).